You can’t predict when an emergency will happen that’s part of what defines an emergency. And when you’re in the midst of one, in this case one that concerns your smile, knowing what you can do and who you can turn to can make a significant difference. If you’re in the middle of a dental emergency right now, Drs. Mauck and Ricci want you to know that they can help. Call our Aurora dental office now with your concerns or questions. We would be happy to advise you on what your next step should be. Drs. 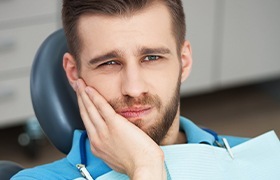 Mauck and Ricci can handle many dental emergencies at their Aurora office, but in some cases, a visit to your local emergency room may be more advisable. 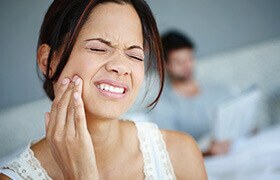 Below are some of the more common dental emergencies that patients face, and tips on what to do in each case. If you have lost a tooth suddenly due to an injury or some other cause, your first step is to rinse the tooth gently with water. Then, if possible, place it back into the socket it came from and hold it there until Dr. Mauck and Dr. Ricci can see you. You can also store the tooth in a bag of milk. During your emergency dental visit, we will determine if reattachment is possible. 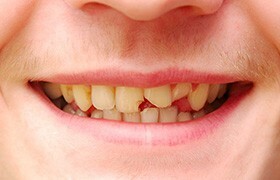 As with a knocked out tooth, the first thing to do it rinse the cracked or broken fragment of your tooth. Then, as you wait to see us, apply a cold compress to the affected area. This will help you reduce or prevent pain and swelling. Though we offer single-visit crowns, maybe you have a temporary crown from your normal dentist and haven’t been able to get in touch with him or her. Give us a call. And in the meantime, you can temporarily manage the situation by reattaching the crown with a small dab of toothpaste, dental wax, or temporary adhesive. Toothaches have more than one cause, some more pressing than others. If you’re experiencing pain, first try rinsing your mouth and flossing around the affected tooth. If that doesn’t do anything and your pain doesn’t subside over the next day, call us. Avoid putting aspirin directly on the tooth as this can damage your gum tissue. If you are bleeding or think you might have broken your jaw, you may need to visit your emergency room. But if you have questions, call us and we would be happy to advise you.